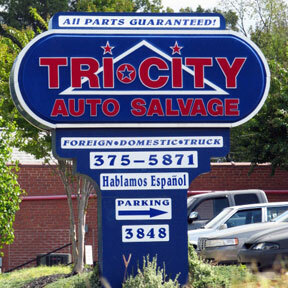 Thank you for choosing Tri-City Auto Salvage for your parts in Raleigh Durham! We offer a huge selection of late model used car, truck and SUV parts for both domestic and foreign models. Family owned and operated through four generations, we have always judged our success by great customer service. For us it’s not about just selling used auto parts, it’s about offering quality solutions for our customers. Our used auto parts sales office and salvage yard are conveniently located in Greensboro, NC with daily delivery and shipping to the Raleigh Durham NC area. Please call today for complete details on delivery availability for the Raleigh Durham area. Used Auto Parts NC is part of the Automotiveinet business network. It offers tips and guidance to consumers looking to buy quality used auto parts for cars, trucks, vans, and SUVS. Find used auto parts in NC, Selling used auto parts in these local areas: Wake County, Durham County, Durham, Cary, Morrisville, Wake Forest, Chapel Hill, Carrboro, Hillsborough, Creedmore, Butner, Raleigh, Burlington. Tri City Auto Salvage serving Raleigh Durham NC.